This is a good article. However, I was wondering about there not being black children on the orphan trains. 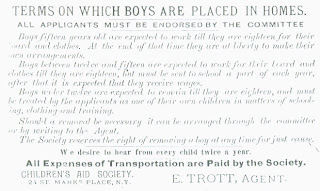 On the genealogy site, Afrigeneas, someone said their friend's mother insisted she was an orphan train child. What came to my mind, is there were no black-identified children, meaning there may have been black children of mixed blood or very fair-skinned who were not identified as black. Whites, who were no doubt running this operation, often cannot identify race if is not presented as black and white. Just something to think about.